Meetings can be a bind when you have to travel the length and breadth of the globe in order to attend them. But hope is at hand for the jet-lagged and white line weary in the form of web conferencing. Although technological advancement has not yet created a means to do away with meetings entirely, it has at least enabled them to be carried out with greater ease. Instead of attendees trekking across the country or continent to meet up with colleagues, associates and clients, they can stay in their home environments and take part in one online, using web conference – or ‘webinar’ - technology. Not only will this save time and effort that can be better spent attending to other work concerns, thereby increasing productivity, but reduce the huge impact that business travel has on the environment and save a lot of money. Holding meetings over the Internet is such a cheap alternative because a meeting can be set up with minimal technological investment. Once every attendee is sitting at a web-connected computer kitted out with a web conferencing software programme, then the online meeting can begin. All participants can then go to a web page where, in real time, they may be able share audio, video, presentations, documents, designs, notes, and hopefully a rewarding and productive experience. This means web conferencing can not only be used for general meetings but also presentations, training, brainstorming sessions amongst other things. This is a significant step forward from teleconferencing, where differently located participants were limited in that they could only hear one another. The programmes that facilitate this might include ones either available free with your computer or downloadable from the Internet, such as Microsoft Meeting Space or Yahoo Messenger. There are also web-based applications available, which mean attendees don’t even need to download software onto their computer; to enter the conference they just simply enter a URL. With the aid of a headset, voice quality of the audio is good but not as good as the traditional telephone. The connection suffers from the usual ailments of any current ‘voice-over-IP’ service, such as Skype. For instance there is a short time delay that takes a bit of getting used to. Nevertheless it’s more reliable than the ever-popular mobile phone and cheaper than both, particularly when long distance calls are taken into consideration. Alternatively traditional teleconferencing technology can be used to ensure the audio’s quality and reliability. The main disadvantage to the basic web conferencing set-up is that participants are unable to see one another in real time. For those organisations that want to communicate and interact by seeing each other then there is the option of adding a video conferencing facility. 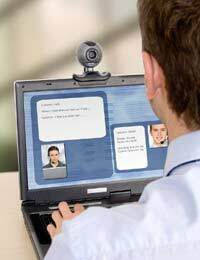 With the aid of webcams or digital video cameras, attendees can engage in a virtual conference where are able to see the presenter and, sometimes, the other attendees. Of course the more advanced the software, technology and features used in web conferencing the more costly it becomes, and serious consideration will therefore have to be made about the organisation’s specific needs. Nevertheless, if employees currently spend a lot of time travelling to meetings then the expenditure will be quickly outweighed by the savings made by cutting down on travel costs. Great article. Web conferencing is a boon for businesses of all kinds. By deploying on premise RHUB web conferencing appliances or using hosted services such as WebEx, gomeetnow, gotomeeting etc. businesses can save travel costs, increase efficiency, have better interaction with customers, clients etc.